Miguel Campbell shot to notoriety in 2011 after ‘Something Special’, his debut release on Jamie Jones' Hot Creations label, became one of the biggest tracks of the year. One year on his debut album, ‘Back In Flight School’, reignites even more cross genre potential. 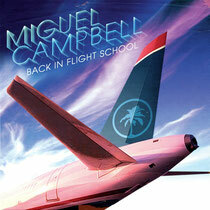 Set to put Miguel back in the end of year charts for a second year running, ‘Back In Flight School’ is a smooth and addictive ride that’s rich in harmonies and full of contagious basslines. From the opening title track to the closing moments, Campbell explores where the highs of house meets the depths of soulful funk and disco nostalgia. Despite his rapid rise to success Miguel has not forgotten his roots. Within his music you can feel the romanticism of the French touch, cheekiness of P-Funk and the energy of ‘80s pop idol Michael Jackson, all culminating in a sound that has cross gender appeal. Campbell’s dextrous use of vocals add an extra dimension to his productions like on the vocoder Daft Punk style rapping of ‘Rockin Beats’, and the warm feminine touch of ‘Not That Kind Of Girl’, his tracks are full bodied and set to lead a long shelf life. Out in the UK, 'Back In Flight School' will see its Australian release on 23rd November through Hot Creations/Balance Music.